The speech therapy provided in this practice will be coordinated with the other services the child receives, including the public school speech pathologists, teachers, ECI programs and private school programs. What makes our Speech Pathologists Unique? We believe that communication is the most important aspect of life. Each therapist has their own strengths and areas of interest. We strive to pair your child with the most appropriate therapist based on the information we obtain about your child and the strengths of each therapist. Your therapist will strive to establish a meaningful personal relationship with your child and family. You will have consistency in your therapist and the room where your child’s therapy is conducted, to help your child feel comfortable and strengthen the rapport. We believe that families DO know their children better than anyone else. The owner, Sandy Mader, has a brother with severe Autism, who was one of the first people in the United States to be diagnosed with this disorder. She understands what it is like to “live” with a special needs child. She has made sure that the Speech-Language Pathologists truly appreciate the family needs as well as the needs of the child. 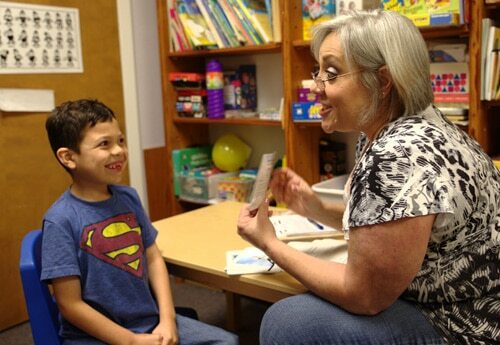 All the Speech-Language Pathologists have Master’s Degrees, received their Certification of Clinical Competence (CCC-SLP) through the American Speech and Hearing Association and are fully licensed by the State of Texas. A variety of voice output devices are available for use during therapy to determine if a device is needed and to decide which device is most appropriate. All therapists are experienced with high tech devices, iPad apps and low tech picture systems. One time evaluations to prescribe specific devices are NOT conducted in this office. Devices are only recommended for children as part of their treatment programming.